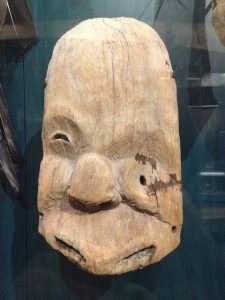 As I was perusing through the many many links to the different cultures of Alaska in the Alaska State Museum, I was most struck by the masks. Besides photographs or paintings, they are the only faces in the whole museum, yet they stand to represent so much. The mask pictured below caught my attention in particular because I was intrigued by the asymmetrical placement of the eyes and eyebrows. Giinaruaq courtesy of the Alaska State Museum– Juneau. The mask was made by an Alutiiq native in Old Sovonoski of southcentral Alaska. The mask, or giinaruaq comes from an ancient tradition, and is at least a couple hundred years old. It has remnants of red paint on it and drilled holes in the sides most likely to allow the mask to be tied to a dancers face, which was typical for an Alutiiq ornamented mask. An Alutiiq who wore this mask would have been transformed into an embodied spirit during a ceremony celebrating hunting, or keeping away evil spirits. It is remarkable that this object has been recovered, because after a ceremony, most masks were were burned, destroyed or buried, as a way to take away the spiritual power of the mask. I wonder what kind of spirit this mask represented. From my background knowledge, I would guess this mask was a silly/trickster spirit, but I am using symbols and cues from modern masks (ie: clowns) to inform my gut reaction, and it could be completely inaccurate. I also am curious what kind of music or dance would accompany this mask in particular and why this mask survived other masks that were destroyed by tradition or by the natural disasters that affected that community afterwards. This mask caught my eye – I like how strange it is. Its really striking with the droopy eye. I feel I totally missed this mask while visiting the museum. This mask really does have a striking quality. The features go with the grain of the wood and center around the knots and “imperfections.” It seems like the artist may have wanted the mask’s features to tie in with the natural features of the wood. I am also intrigued to know the story of this mask and how it survived destruction.